Study outcomes: In 1996–2004, three rounds of oral visual inspection were provided by trained health workers at 3-year intervals to eligible individuals (aged ≥ 34 years) in the intervention group. We reported a 35% decrease in mortality rate among the tobacco users/alcohol consumers of the intervention group compared with the control group. This evidence was used by India’s National Programme for Prevention and Control of Cancer, Diabetes, Cardiovascular Disease and Stroke (NPCDCS) to support their recommendation of oral visual screening of the population. Publications: Sankaranarayanan R., Ramadas K., Thara S., Muwonge R., Thomas G., Anju G., Mathew B. 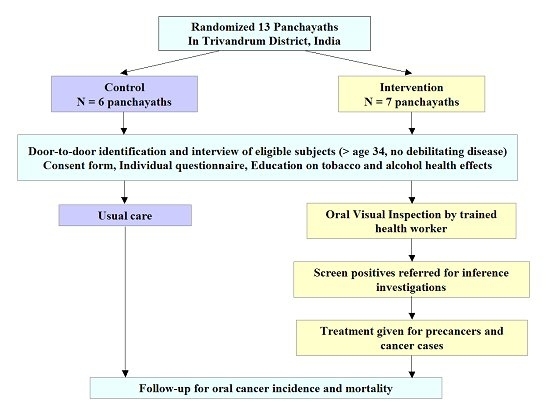 Long term effect of visual screening on oral cancer incidence and mortality in a randomized trial in Kerala, India. Oral Oncol. 2013;49(4):314-21. Ramadas K., Sauvaget C., Thomas G., Fayette J.M., Thara S., Sankaranarayanan R. Effect of tobacco chewing, tobacco smoking and alcohol on all-cause and cancer mortality: a cohort study from Trivandrum, India. Cancer Epidemiol. 2010;34(4):405-12. Subramanian S., Sankaranarayanan R., Bapat B., Somanathan T., Thomas G., Mathew B., Vinoda J., Ramadas K. Cost-effectiveness of oral cancer screening: results from a cluster randomized controlled trial in India. 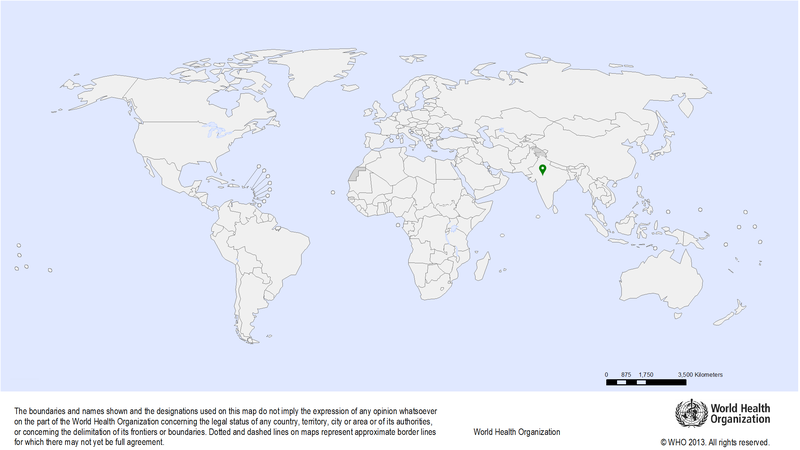 Bull World Health Organ. 2009;87(3):200-6. Sankaranarayanan R., Ramadas K., Thomas G., Muwonge R., Thara S., Mathew B., Rajan B.; Trivandrum Oral Cancer Screening Study Group. Effect of screening on oral cancer mortality in Kerala, India: a cluster-randomised controlled trial. Lancet. 2005;365(9475):1927-33. Ramadas K., Sankaranarayanan R., Jacob B.J., Thomas G., Somanathan T., Mahé C., Pandey M., Abraham E., Najeeb S., Mathew B., Parkin D.M., Nair M.K. 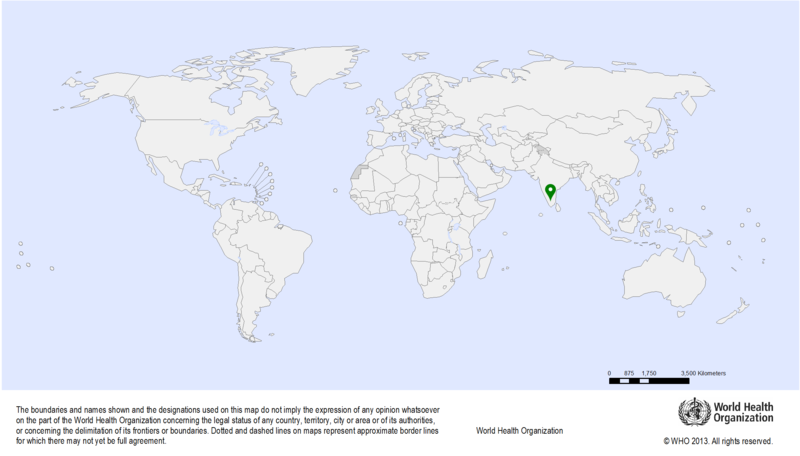 Interim results from a cluster randomized controlled oral cancer screening trial in Kerala, India. Oral Oncol. 2003 Sep;39(6):580-8. Methodology: This is a multicentre study including recruiting centres in Europe and India. The Screening Group is collaborating with the Indian centres. Approximately 4000–6000 HNC specimens are collected from several Indian centres from rural or urban areas. The specimens include cancers of the hypopharynx, oropharynx, oral cavity, and larynx. Each Indian centre provides approximately 1000–1500 specimens representing the four anatomical sites. Epidemiological and clinical data are also collected when available. Publications: Ursu R.G., Danciu M., Spiridon I.A., Ridder R., Rehm S., Maffini F., McKay-Chopin S., Carreira C., Lucas E., Costan V.V., Popescu E., Cobzeanu B., Ghetu N., Iancu L.S., Tommasino M., Pawlita M., Holzinger D., Gheit T. Role of mucosal high-risk human papillomavirus types in head and neck cancers in Romania. PLoS One. 2018 Jun 25;13(6):e0199663. Gheit T., Anantharaman D., Holzinger D., Alemany L., Tous S., Lucas E., Prabhu P.R., Pawlita M., Ridder R., Rehm S., Bogers J., Maffini F., Chiocca S., Lloveras B., Kumar R.V., Somanathan T., de Sanjosé S., Castellsagué X., Arbyn M., Brennan P., Sankaranarayanan R., Pillai M.R., Gangane N., Tommasino M.; HPV-AHEAD study group. Role of mucosal high-risk human papillomavirus types in head and neck cancers in central India. Int J Cancer. 2017 Jul 1;141(1):143-151. Participants will be screened for hypertension, diabetes, oral cancer (for habitual users of tobacco products and/or consumers of alcoholic beverages), and cervical cancer (for women only, by HPV testing on self-collected specimens). Women will be made aware of common symptoms and signs of breast cancer. All services will be provided at home. The screen-positive men and women will be navigated to reach appropriate diagnostic and treatment centres. Publications: Basu P., Mahajan M., Patira N., Prasad S., Mogri S., Muwonge R., Lucas E., Sankaranarayanan R., Iyer S., Naik N., Jain K. A pilot study to evaluate home-based screening for the common non-communicable diseases by a dedicated cadre of community health workers in a rural setting in India. BMC Public Health. 2019 Jan 3;19(1):14. Mahajan M., Naik N., Jain K., Patira N., Prasad S., Mogri S., Muwonge R., Lucas E., Faruq F., Sankaranarayanan R., Iyer S., Basu P. Study of Knowledge, Attitudes, and Practices Toward Risk Factors and Early Detection of Noncommunicable Diseases Among Rural Women in India. J Glob Oncol. 2019 Apr;(5):1-10.